Submitted by ryanl on Tue, 07/31/2018 - 09:29. The 18th July 2018 marked the centenary of the birth of Nelson Mandela where people around the globe were encouraged to give one minute of service for each year that he dedicated to the fight for social justice. 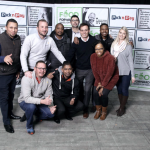 To celebrate the occasion, this year our Johannesburg sales team volunteered at FoodForwardSA’s Mandela Day Food Drive by packing and sorting donated food items for 67 minutes. For the second year now FoodForwardSA partnered with Pick n Pay to host a national packing event at various venues around the country. During the month of July, South Africans donated 151 tons of groceries to Pick n Pay stores nationwide which were distributed to the various packing venues. On Mandela Day, 7500 volunteers spent 67 minutes sorting and packing the food to stock FoodFowardSA’s warehouses across the country. FoodForwardSA, a registered NPO, assists with delivering surplus food from retailers and manufacturers to communities who are affected by food insecurity. The 151 tons of food donated this year equates to 604 000 meals which will ensure that FoodFowardSA’s 600 beneficiary organisations can continue to provide warm meals this winter to the 250 000 people they feed every day. Our sales team enjoyed the experience and the time spent giving back.